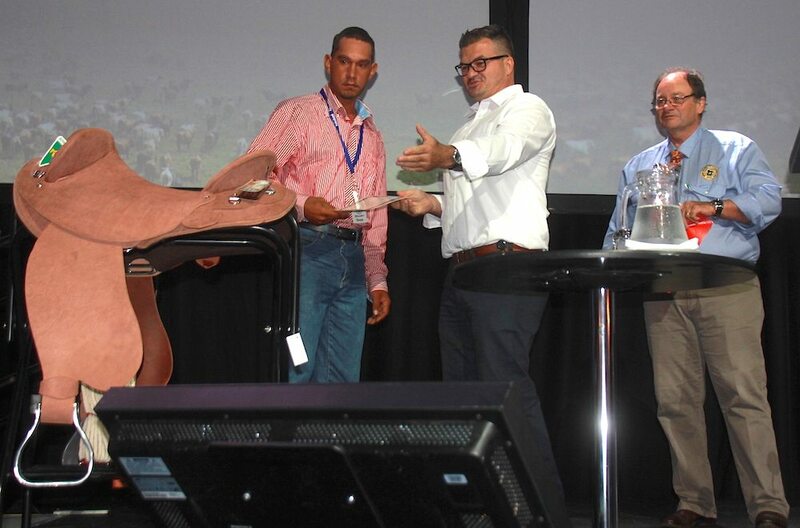 Stewart Foster is presented with the Inaugural Alward Foster Memorial Award by Northern Territory Primary Industry Minister Ken Vowles at the NT Cattlemen’s Association annual conference in Darwin on Friday. Morestone Downs leading hand Stewart Foster, 22, was named the inaugural winner of the Alward Foster Memorial Emerging Indigenous Pastoral Leader Award at last Friday’s NTCA conference in Darwin. 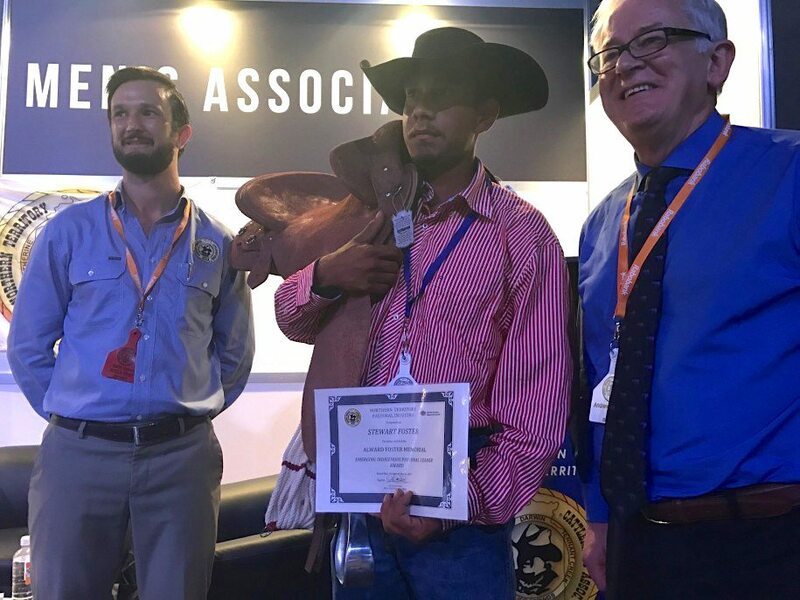 The award is named in honour of the late Alward Foster, who joined the NTCA’s Pastoral Real Jobs Program as an employee on Newry Station on the West Australian border, and later joined the NTCA to mentor young indigenous people and Indonesian exchange students in the NT. The program was established to to attract Indigenous Territory men and women to cattle station life, and is supported by the NTCA, the Central Land Council and National Indigenous Pastoral Enterprises. Stewart is also a participant in the Pastoral Real Jobs Program. He worked at Manbulloo Station near Katherine and Auvergne near Timber Creek before becoming leading hand at Morstone Downs near Camooweal. Morstone Downs managers Ian and Kerrie Fletcher say Stewart is an independent man and a “great role model for the younger generation”. “He balances his family responsibilities, culture and working in a non-Indigenous environment very well and without hassle. NTCA’s Tom Ryan and former trade minister Andrew Robb congratulate Stewart Foster on his award. “He has been known to take on a few young fellas that follow him on his journey and without realising it, he mentors and supports them. The Fletchers describe him as a “bright, talented gentlemen with a great work ethic”. Stewart recently gained a Certificate III in Agriculture and is now starting Certificate IV. NTCA chief executive Tracey Hayes said: “We’re delighted that such a role model as Stewart is the first winner of this award. “Indigenous people played a key role in opening the Northern Territory to pastoralists and we want to attract more Aboriginal stockmen and women back to the industry. The namesake of the award, Alward Foster, became a full-time NTCA staff member after participating in the Pastoral Real Jobs Program. His job was to train, mentor and support young Indigenous people in the Real Jobs Program and Indonesian students from the NTCA Indonesian Australia Pastoral Program. An NTCA statement described Alward as a natural born leader, who once went to Canberra and showed then Prime Minister Julia Gillard how to crack a stockwhip.